Morality may be defined as rules of conduct which determine what rational•1 beings•1a should do and what they should avoid doing. Or we may assert that morality relates what a rational (moral) being may•2 seek with the acceptable means for obtaining what is sought; this while simultaneously identifying what may not be sought, and what means may not be employed, in the pursuit of a good end. 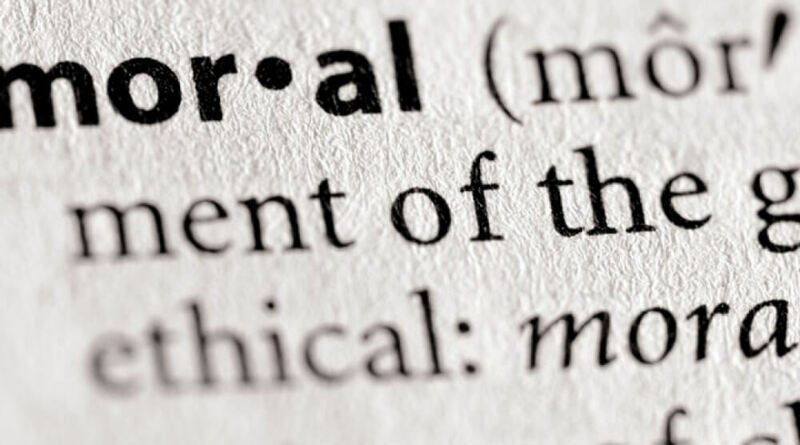 The justification for delineating what constitutes morality, and why morality is necessary is because so much today is politicized, and thus is evaluated, not by whether it morally obligatory, but rather whether it is politically expedient. Forgotten, purposely in most instances, is that Law presupposes moral beings and moral beings presuppose rational existence which presupposes God. We note that the government of the United States has no Constitutional interest in the health-care of its citizens, but it has a compellingly selfish interest in its citizenry’s moral dispositions. And thus, we reiterate: “Law presupposes moral beings!” Thus, the impetus for passing on a few thoughts regarding what constitutes: moral, and why our Nation’s institutions should ubiquitously encourage both the assimilation of moral principles and the practice of moral conduct through the self-imposed regulation of the panoply of human impulses a.k.a. virtue•3, and individual choice. Note: We will not – here and now – delineate a moral code, or system, but put that off for another day. Morality – or a code of morality – that is not universal and objective (i.e., independent of the moral entity), is not morality; a moral system, or code, should be as objective and universal as a mathematical function, thus what is then deemed as “moral” cannot be reasonably accused of favoring one individual, or group, over another. Morality must be universally binding; that which is moral today, if moral, will be so tomorrow, and it’s geographical location – or cosmological, for that matter – will not alter what action ought•7, or ought not, be performed; nor what ought to, or ought not to be desired. Rational beings (e.g., humans) are sapient entities (i.e., possessed of intellectual discursiveness, or a discerning mind); sapience is an essential property of moral beings (logically contained in the concept of moral being); sentience i.e., sensuality, is not essential, but accidental•8. One may assert that: “all moral beings must necessarily possess bodies, and that their body exerts an influence upon the moral judgment…” Several points are raised in such an assertion, we address them thus: 1.) Possessing a body, or being possessed of a body, does not alter what constitutes moral conduct 2.) Moral beings need not possess bodies e.g., angels•9 and the-day-may-arrive when moral beings may possess a body e.g., robots, which have been programmed for moral choice. •6 The end of the social-political Left: We do not here wish to homogenize the Left, some are consciously – maliciously – advocating power acquisition for the very end which we assert; others are motivated by selfish intuitions, these latter are used by the former to advance the former’s agenda’s; ultimately what drives them is an abject hatred of the Truth, because the Truth carries an objectively obligatory deferential imperative… In the social-political Left’s diatribes regarding objective moral principles, and especially for the advocates of such imperatives, is an echo of Lucifer’s: “I will not serve!” – characterizing their opponents by a litany of epithets e.g., misogyny, racism, homophobia, sexism, isolationism, xenophobia etc. •9 Angels – the Superstring theorem Crowd cannot have their “cake” without its “frosting.” angels are incorporeal rational beings. •10 Anthropological genealogy – I do not want to develop this here, but will assert that synderesis i.e., the native conscience, in a circumspective – unconsciously lamenting sentimental reflection on human suffering lead to intuited generalized altruistic impulses, and those in turn developed into codified moral systems; thus sentiment and emotions play a role in moving rational beings towards the thought necessary to discover the natural law, but they – emotions and sentiments – play no role whatsoever in determining what constitutes morality. •11 Several points: although Christendom was a product of an organic process, it was synergistically aided by Creation and Revelation effect upon both synderesis & finality…The embrace of Creation and Revelation established a moral teleology – or purpose to the human faculties of reason & will, which leads to the gradual emergence, and embrace of the Rule of Law on the part of the Judeo-Christian West.